Take the Silk Road to China and try and pocket some Asian gold in Coin! Coin! Coin! This simple 5 reel, 10 payline video slot has been created by Playtech and features top notch sound and visuals, expanding wilds as well as giving you a shot at landing a progressive jackpot prize. Play on all devices from between 80p and £880 per spin. There’s a classical feel to the design here with red and gold dominating the colour palette. The plain white reels are flanked by a pair of imposing golden dragons. There you’ll find a collection of symbols relating to the Chinese theme. The lowest paying symbol features the golden bells. That’s followed by money wallets, red lanterns and a turquoise kite. Then comes the tortoise which awards 10 times your bet for a 5-symbol combination followed by the waving kitty which pays up to 25 times your bet. The golden pot is the most rewarding symbol. You’ll receive an award of 5, 20 or 80 times your bet if you land 3, 4 or 5 of these in a line. Helping your winning chances is the golden coin which is the game’s wild. It replaces all other symbols. Whenever a coin lands. it expands and fills the whole of the reel to turn it wild. It’s possible to land multiple coins on the same spin to turn more than 1 reel wild. The real money shot arrives if you’re lucky enough to land 5 coins and turn all 5 reels wild. You’ll then scoop the progressive jackpot and a potentially enormous reward. That’s your lot as far as gameplay goes. You won’t find any free spins or pick me prizes here. All the action revolves around the expanding wilds in the base game. That lack of variety might make Coin! Coin! Coin! sound like a rather boring game. We didn’t find that to be the case. The expanding wilds came along often enough to keep things interesting and there’s always the tantalising potential of the progressive jackpot. Visually, this is very well put together. Likewise, the traditional soundtrack. If you’re after plenty of extras. then look elsewhere. If you fancy spinning a super simple Chinese-themed game, then that’s precisely what’s on offer in Coin! Coin! Coin! Playtech are 1 of the best software providers so I suggest you try of their great titles like Anaconda Wild and Eliminators. 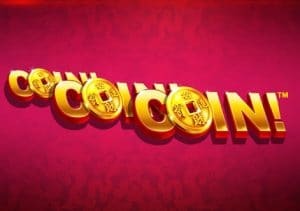 Recommended casinos to play Coin! Coin! Coin!